As a counter to last year's brilliant but cool holiday in South Africa, we had decided to go somewhere hot again this year. 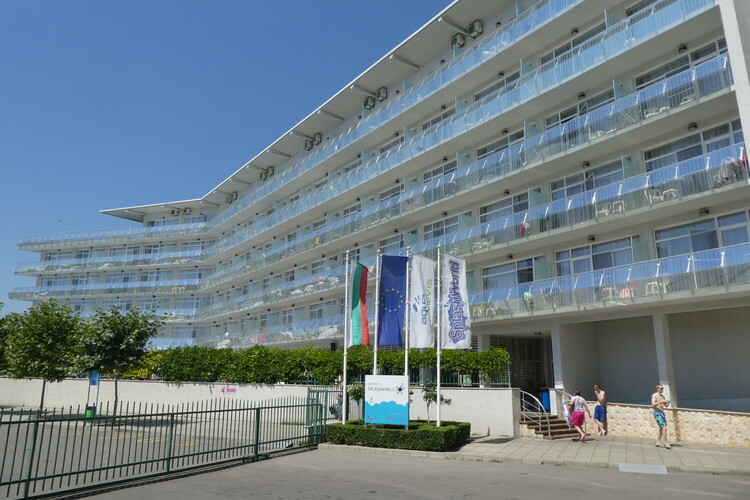 Bulgaria has become popular, with reliable good weather, European membership (hah!) and cheap living. 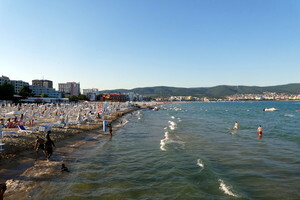 A large part of its Black Sea coast is called Sunny Beach, and has developed into a large resort area. We booked into an all inclusive hotel called Aqua Nevis, named after my uncle and aunt's old dog, which is attached to the Action Aquapark. The water park is open to the public but we have free entry and our own entrance straight out of the front of the hotel. 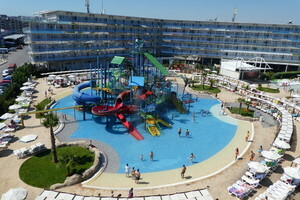 There isn't a huge amount else to do at Sunny Beach so the water park will feature in most of our days. Bulgaria might be in the EU but it's not in the euro yet, so we had to stock up on the local currency, the Lev. You get just over 2 Leva to the pound, so it was fairly easy to calculate how much things were. The flight over was one of these night time ones, and we got to our hotel at 3 in the morning. Claire still insisted on unpacking everything before we went to bed, so we didn't get a great deal of sleep on that first night. I went down to the introduction talk at 10, which was useful, but also a chance for the reps to try and sell us various excursions. To be fair, while I said there isn't much to do, there are quite a few boat-based excursions but Claire's seasickness counts them out from the start. The first day was rainy so we didn't get much in the way of sunning ourselves, however the hotel laid on a bus trip to a mall in Bourgas, where we wandered the shops for a couple of hours. 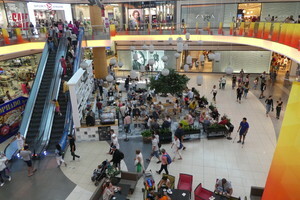 It was much like malls anywhere, with lots of designer shops and not much of interest to us. We did find a book shop that had the Bulgarian translations of several Discworld books and a Bulgarian dubbed Twilight DVD. The next day set the pattern: breakfast around 9, then over to the water park at 10, lunch at 12:30 at the hotel pool bar, back at 5 for showers and dinner at 6:30. Bingo at 9 and then off to bed while the dodgy entertainment blared on until 11. The comments on the hotel sometimes criticised the lack of variety in the restaurant, but I found there was plenty of choice, I had something different every evening, and enjoyed most of it. 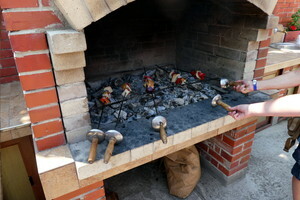 It was no Marylanza, and the pool bar just had pizza, burgers and hot dogs, but no complaints here. The ice cream man gets a lot of mentions in the reviews, and he was a nice guy, fun and friendly. 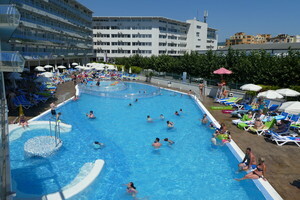 The hotel pool wasn't too busy, since most of the guests spend a lot of time in the water park. We always found loungers and there were always some shaded ones for us delicate-skinned Scots. It was quite windy, so we often saw inflatables scooting across the pool to the bottom end where they gathered in a big pile. We went down to the bingo every night, and even won with a line one night, which gave us enough money to pay for an excursion. 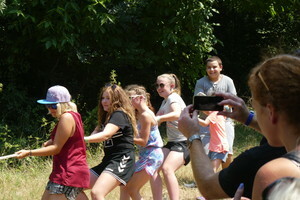 The reps worked hard with the kids entertainment but it was definitely repetitive and not to our taste. The main acts were mainly singers, and we generally didn't stay, but got to enjoy the delights of "Tom Jones" and the like from our room. Worst of all for me, though was that they had an English version of Chu-Chu-Ua. 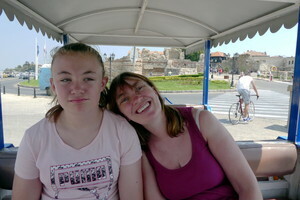 The best aspect of that song in previous holidays was not having any idea what the Spanish man was telling us to do! We did manage to guess La penguino right enough. 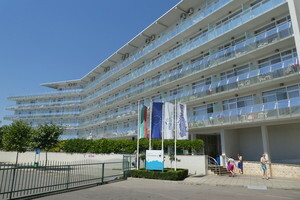 In fact, the hotel was very much British-focussed with the reps all speaking English and no multi-lingual announcements. Most of the guests were British, which you may consider a good or a bad thing. In the water park there were more nationalities of course and seemed to be a lot of Russians if my ear for languages is working. The only negative I found with the hotel is that music is played all through the day, and it's the same set of a dozen or so songs that keep coming up. The reps also seemed to have a theme song they always ended on. 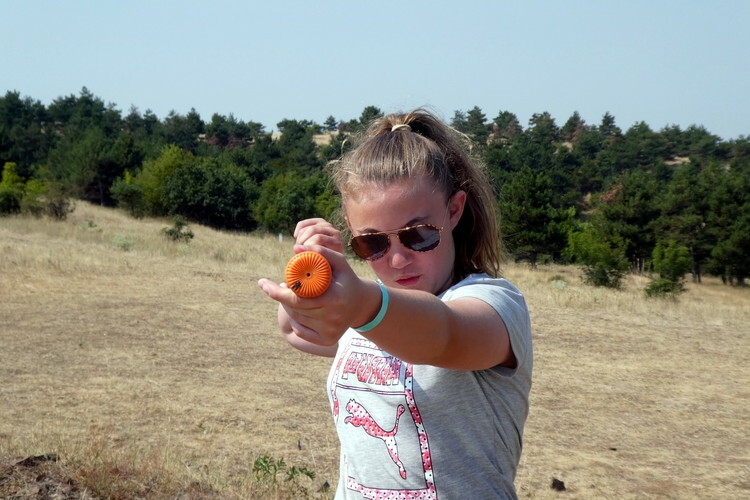 It took a while to work out what it was but it turned out to be a local celebrity from Bourgas, who had won the Bulgarian X-Factor in 2011. 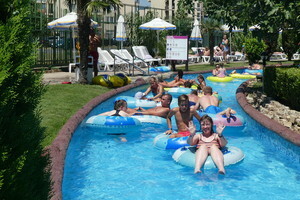 We spent most of our time in the water park. 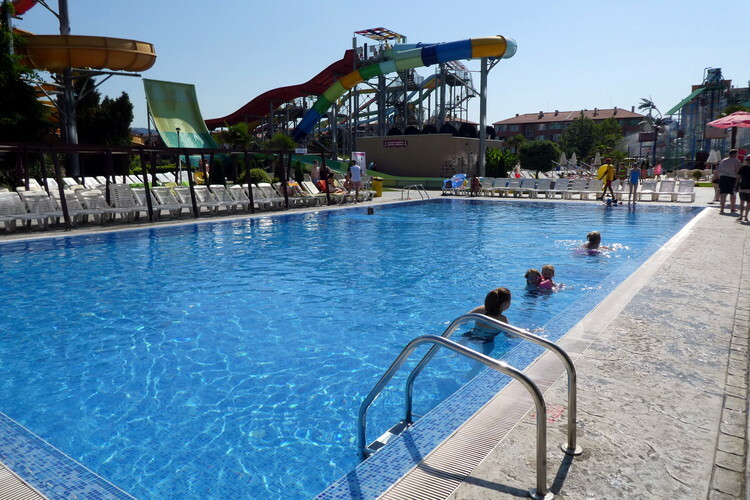 It's a pretty decent one, with 14 big slides, a small wave pool, lazy river, kids play area with slides, etc, and our favourite area: the music pool. This is just a normal rectangular pool with loungers around it but it was a good area to settle for reading and the occasional set of lengths. And the loungers were nicely shaded. A couple of the slides were very busy, with big queues most of the day, but the rest were quick to get on, whether body slides or rubber ring ones. There were a few very steep body slides, but I found the scariest part was climbing up the stairs up to four stories high. 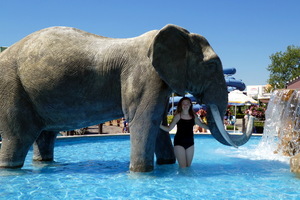 It's not as impressive as Siam Park, but it kept us occupied, and of course free entry for us made quite a difference. One interesting observation: in all the time we spent at the water park I saw 4 black people. I don't know what that tells us about the resort but will leave it for discussion. There are a few photographers taking pictures of folk as they come out on to the flumes. They actually print out all the photos and display them on a board for sale at a reasonable 5 leva (£2.50). Surprisingly, given the number of people in the park, we were able to spot ourselves a few times. 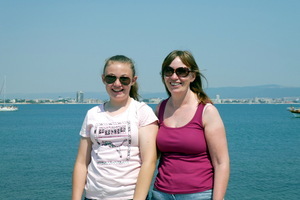 We ventured out of the hotel a few times to see what Sunny Beach is like. We were right at the back of the resort, beside the main road that runs by it, so it was a ten minute walk in to the front, along some pretty poor roads and pavements. We'd heard about muggings in the area, but the worst we got was a wee beggar boy who was interested in my pockets. The beach is packed with sun loungers and umbrellas, so we didn't really fancy spending a day down there. The promenade had loads of stalls selling ice cream, trainers, sunglasses and henna tattoos, and the main walk in featured more of these shops, plus some restaurants and places of dubious morality. There were also a lot of folk scooting about on little three wheel electric scooter things, which seemed to be popular. We only saw the front in the early evening. I imagine it gets a lot busier as the night draws in. We didn't wait to see. We did walk down on a few evenings, though, and picked up presents for taking home, plus some dodgy designer attire. 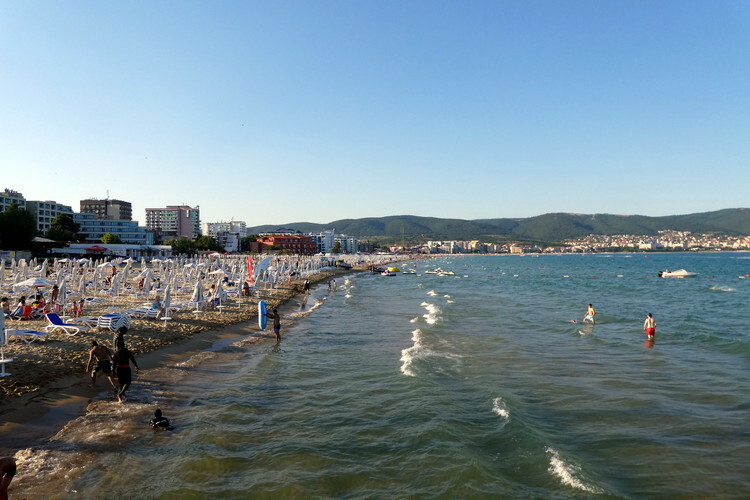 Sunny Beach is close to the town of Nessebar, and we took a bus ride over to the town for a walk about one day. Old Nessebar is built on a peninsula, or an island with a causeway out to it, and features lots of old buildings, including a few ruins from hundreds of years ago. This was well worth a trip around, and it had some tourist shops which were a bit more tasteful than the ones in Sunny Beach. We had been advised to visit Michael's Eco Bar, which we did when it opened at 12, and found that we were down in what was made to look like a cave, with stalactites and mites, a waterfall and turtles, all in one small building. We had some ice cream sodas here. 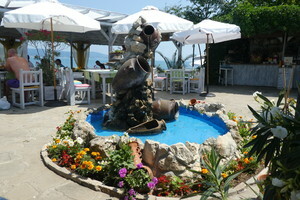 We also stopped at another place for some food, before taking the mini train back to Sunny Beach. 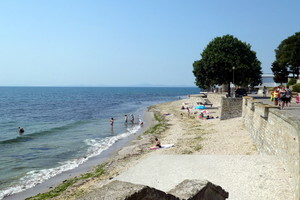 Unfortunately the train stops just as it gets into Sunny Beach, so we still had half our journey left. Fortunately Cate spotted a free bus to the aqua park so we hopped on that to get back in good time. 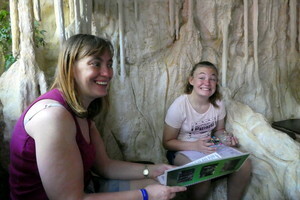 After winning a line on the bingo we decided to try one of the excursions. We'd been to Nessebar and to the mall in Bourgas, and the boat trips were out of the question, so we booked up for the four by four adventure. On Monday morning two jeeps came to the hotel to pick us up. We stopped on the way for another couple and gathered with the other jeeps for the start of the trip. We were on Riki's jeep, with Mickey the videographer, an English couple from our hotel with their girl Kaylynn, and a mother and daughter, Denise and Sky. 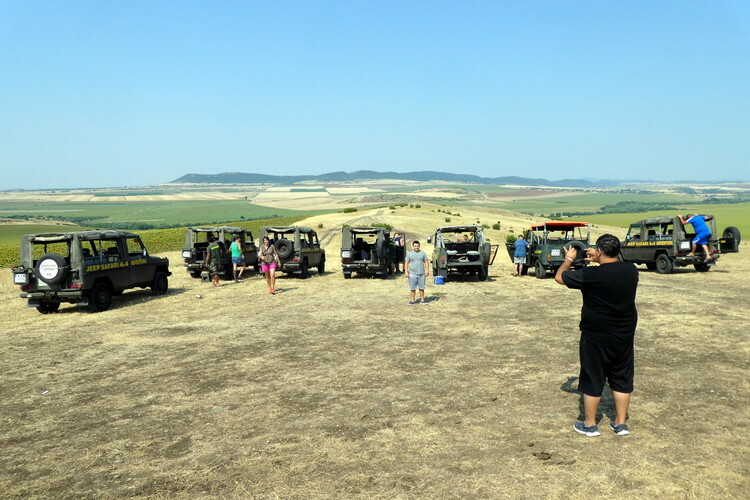 The jeeps took us up into the hills behind Sunny Beach, passing sunflower fields and grape vines on the way. We indulged in water fights on the way, and Riki had the advantage of a skoosher on the front of his jeep to get the folk in front. 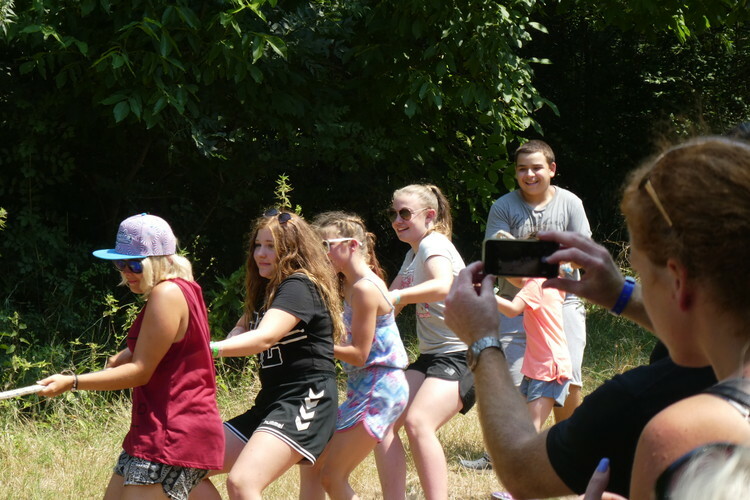 We stopped for a while at a natural spring, to reload water bottles, and to have a shot at firing a pellet gun, and a tug of war. After a bit of off-road action to set off Claire's travel sickness, we ended up at a nice farmhouse where we had lunch, roasting our own spits on the barbecue fire and made to participate in some dancing before we headed back to Sunny Beach. We had a nice day out and it was a good chance to see a bit of rural Bulgaria. The flight back was even later than the flight out, at 2am. 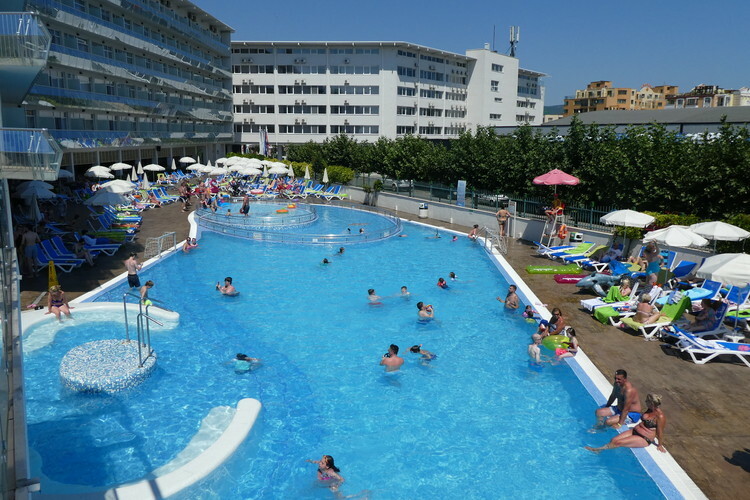 We arranged with the hotel for a late checkout, so we could have a full day at the water park (again), dinner and even a last round of bingo before bringing our cases down and waiting for the bus. The bus trip took a bit longer as we headed down various dirt tracks to pick up folk bound for the Glasgow flight. To make matters worse the lady behind Claire spewed up for the last 10 minutes. The flight was long and we were packed in like sardines, but we made it home at last, for a warm welcome from Charlie (hardly!) and a couple of hours sleep before starting off the washing pile. 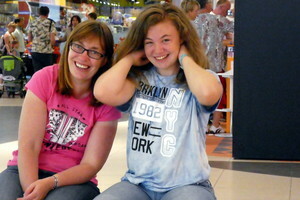 We had had some Bulgarian money left at the airport, so got home laden with Toblerone and Lindors. For those fans of the "how much weight can David lose despite spending 2 weeks gorging himself at the buffet", this year's answer was 3lb.